← I think I’m ready. A wooden toothbrush is the best toothbrush! I finally got my wooden toothbrush in the mail yesterday. I’ve used it twice and so far I can say that without a doubt, I will not be going back to using a plastic toothbrush. I’ve also heard about toothbrushes made from bone and boar hair… but being a vegetarian, I really have no desire to go that route! 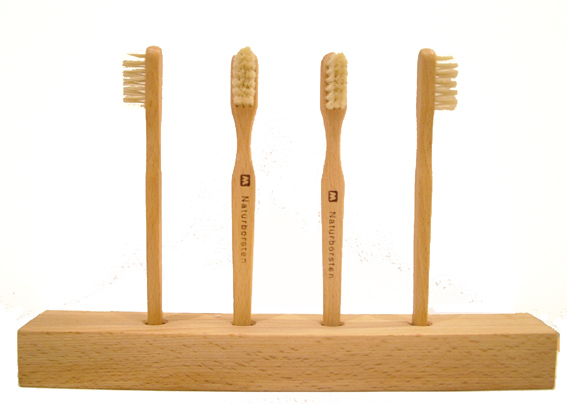 I purchased a Naturborsten (a family owned and operated company in Germany) toothbrush through Life Without Plastic. The handle itself is wood (no clue what kind) and preserved with vegetable oil; the bristles are natural fibres. There are no fancy bends in the handle or various lengths of bristles, but do those things actually make one toothbrush better than another anyway? Probably not. There’s a very slight (barely there) wood taste and the bristles aren’t as soft as I generally like, but those things aren’t a big deal. It still does the trick just fine. 1. The toothbrush cost $7.40 (Cdn), which isn’t that bad and which I’d pay again. However, the cost of shipping – $9.90 – was pretty absurd, especially considering the fact that it took almost a month to be delivered. 2. The toothbrush came in a massive box with lots of brown paper to pad it inside. Both the paper padding and the huge box were completely unnecessary. Why couldn’t it have been sent in an envelop, or even a much smaller box? I’ll probably buy the toothbrush from another company when I need to replace it, but other than that, I have no complaints so far! This entry was posted in Products and tagged Naturborsten, plastic-free toothbrush, Toothbrush, wooden toothbrush. Bookmark the permalink. 7 Responses to A wooden toothbrush is the best toothbrush! FYI the natural fibers on this brush are made from pig hair, may not sit well with the vegans. Where did you get the brush from? I’ve found a few sites that sell packs for 4-12 depending on the site. 🙂 Just found your blog…I’ve been doing the same thing over the last couple of years…it’s cool to know someone else is too. there are ones for 3 bucks in oz and free shipping. Natural toothbrush company i think it is. Bamboo. In case if any one is interested, I found a wooden bamboo toothbrush from Simply Green Baby. The cost is only $5.99 and if you buy more the price goes down. The bristle is made of nylon. The best part is that for every brush sold one is given to a child in need in communities throughout the world. Hi Emily. Thanks for the note! A bamboo toothbrush is definitely much better than the plastic ones sold at drug stores! And of course it’s GREAT that they give them to kids in need! But on a plastic stand-point, nylon is plastic, so these toothbrushes still shouldn’t be purchased if you’re looking for a completely plastic-free toothbrush. to be shared around the web. Disgrace on the seek engines for now not positioning this post upper! I just bought one from a store called Tamarak in Saskatoon! Excited to see how it goes. Also, the cashier said that with natural fibre brushes, you can soften the bristles to your liking by putting it under hot water.